The Buzz Saw (aka the circular saw or the circ saw) is one of the most used saws for many woodworkers. Picking the right saw for any one who is going to be heavily using one is therefore important. There is a wide variety, so make sure you have done your research before buying one. Hand held electric buzz saw are portable, powerful and able to crosscut, rip wood and cut of material with material specific blade. What is a Buzz Saw (Circular Saw)? 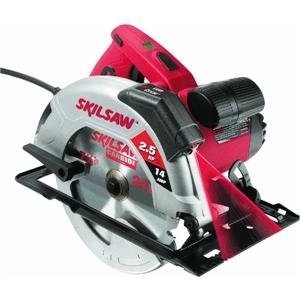 A circular saw, sometimes referred to as a buzz saw, is a tool used for cutting wood, plastic, metal, or masonry. Typically, a circular saw is easily identified by the presence of a metal disc or blade with teeth on the edge and a mechanism that causes the disk to spin. The tool can be either hand held or table mounted. From a woodworking point of view, it is one of the most used saws in the daily work life of a cabinet maker, the framer, or construction worker. The flexibility and precision of this workhorse make the circular saw invaluable for the professional. One of the most popular power tools in any do-it-yourself enthusiast’s collection is a circular saw. It’s multipurpose use for cutting almost any type of cut and interchangeable blades to cut different material types makes it a valuable tool. Here are a few tips to consider when making a purchase. Throughout recent pages we had a close look at what the best buzz saw must look like for any professional woodworker. Starting with a buzz saw review to various close looks into what is the best plunge cut circular saw, to what to look for in a cordless circular saw. We also looked into guide rail systems and the best circular saw blades when cutting wood and other materials. Now let's finalize it all into what the best circular saw should look like. A circular saw is an electric saw that turns a round flat blade to cut wood, metal, or plastic depending on the blade selected. Circular saws have a handle with on/off trigger switch, an arbor nut to hold the blade in place, and guards to protect the operator from touching the spinning blade. In addition, circular saws have height/depth and bevel adjustments. Refer to the circular saw's operations manual for specifics. The Circular Saw is a powerful, versatile, yet if mishandled, dangerous tool. The Circular Saw is not the easiest tool to use for the beginner, but is easily the most dangerous. Make sure you know exactly what you are cutting and how before you start. Make sure you are using the power of the saw in a manner that turns out is in exactly way you want it to. A buzz saw, or circular saw, can refer to one of several types of saws utilizing a circular blade for cutting. Drawing its name from the loud and shrill noise the saw makes when cutting wood, the buzz saw remains one of the most popular woodworking tools, and the saw is a staple in any carpenter's tool shed. While variations of the buzz saw include the table saw and miter saw, the portable hand-held circular saw is the most common, and the following instructions apply to its operation. A good buzz saw should have enough raw power to slice through everything from wet lumber to dense hardwood without bogging down. "When the motor slows, the blade heats up and dulls quickly," explains Tom Silva, This Old House general contractor. This not only produces a poor cut, it's dangerous because the blade can climb out of the kerf and push the saw back toward the user. However, evaluating power from the motor ratings can be misleading. Amps indicate only the amount of electricity a motor draws, not the power it sends to the blade. Horsepower accounts for torque, but not necessarily under working conditions. Measure and mark. On both sides of the plywood, use a tape measure and pencil to mark the desired dimensions needed for your project. Place blue painter’s tape over these lines, and mark the dimensions again. The tape will minimize tear-out (ragged edges) on the plywood along the cut.